Hello Chris and Susie, Thank you so much for the wonderful stay we had this past weekend. Everything was great. The special touches, like the dog biscuits with a bow, and the restaurant discounts, were over the top and much appreciated! I have already recommended the cabin to some friends and sent them some pictures so hopefully they will come stay at Chamlee or another cabin soon. Just wanted to express my appreciation and let you know I will be back! Have a great week, N.B. Thank you for the Birthday "Cake". Very thoughtful and delicious. Thank you for the late check-out. Please tell the owners we enjoyed the decor, the spirit of the place. Services and Staff were Excellent. Chris picked out the perfect cabin for me that was close to the trails. I loved the place. Very Friendly and easy check-in. We had a wonderful stay. Place was clean and beautiful. Staff at Vacation Rental Office were friendly and made us feel at home. Thank You!! Staff and Customer service were amazing! The house was clean with the exception of a few unwelcome eight legged friends, the location and the customer service were beautiful!! We will surley be back. House was clean when we arrived, had a ping pong table and a jacuzzi, Services and Staff were good. Thank you we had a lovely stay! It was wonderful. We had a wonderful time! Hope to be back soon. Thanks. House was Clean, services and staff were awesome. Chris went above and beyond helping us with some car trouble. We will recommend this place & Company. Thank you for being so kind and generous and taking the extra miles. My family and I had a relaxing weekend stay at the Beaver Lodge in Idyllwild! Cute place, my family enjoyed our entire stay, will definitely book again. Great place for rest and relaxation. Very close to town. Heating was on point and jacuzzi readily warm. I recommend staying here. Would love to be back. Really nice place with plenty of room for my family to spread out. Amazing sunset views. A perfect rustic mountain retreat. We really liked it. I would stay there again. Thanks! Lovely, cozy cabin nestled down a long path into the woods! This log cabin home is set by beautiful Idyllwild on a hill with a nice view. Decorations and furniture were eclectic with a nice South West and Log Cabin theme. We enjoyed the large number of beds (master with queen, queen on one side of loft, queen/full (?) & twin other side of loft (with curtain separation) and pull out sofa on bottom floor. Having bathroom on each floor was nice. We also enjoyed soaking in the jaquzzi outside under the stars. We loved staying at Soft Rock Lodge! The location was perfect - convenient to town and trails. The driveway is very steep, so if there's bad weather, be sure you're prepared. Since the property is 3+ stories as well, make sure you're prepared to climb stairs (and again, have appropriate footing if there's snow). We loved the unique layout of the cabin. It was clean and cozy, with a beautiful view. The fenced in yard was perfect for our dogs, and the hot tub was a nice treat in the snow! The kitchen had everything we needed to cook, and all the amenities were as listed. The downstairs "bedroom" is enclosed and has a pullout couch (not comfortable, but to be expected). The main bedroom and bath were great, and then the loft has three beds, but is open to the living room (below). It was fine for us, but would be helpful to know in advance. It was a perfect escape for us from San Diego, and 100% would stay there again! The Beaver Lodge was perfect! This was our first time to Idyllwild and I can�t wait to go back! The cabin was very spacious and cozy and exactly what we were looking for. The deck was beautiful and we used the bbq about every night. Couldn�t have asked for a better experience! The fireplace was perfect for our evening while we enjoyed a movie from their vast collection of DVDs. We had quite a few issues come up with things not working but thankfully the after-hours number and customer service was quick to address all the issues. The fenced in yard was excellent for our pups as is the built in dog door. The backyard had scraps of plastic and wood laying around and the hot tub was on its side so definitely not the most pleasant sight to see. Overall, the size of the house was as described and perfect for our needs. This place was just what we needed - a cabin that felt away from it all, but was walking distance to the village center of Idyllwild as well as some of the best hiking trails. We hiked, we cooked, and we sat fireside in our cabin. Everything was extremely convenient, the kitchen was stocked with the right essentials, the bathrooms were clean and the beds were comfy. The perfect place to relax for a long weekend away from the city. We will definitely rebook next season. We really enjoyed our stay at this cabin! It was very cute and the location was great. It�s up on a hillside nestled amongst some trees. Scenic view from the back deck and hot tub! The place is pretty spacious, and had all the basics you�d need in the kitchen. There were only 3 of us, but it could easily accommodate 6 or 7 with plenty of room. Living room was quite cozy. Communication was great, and checking in and out was very easy. Great experience in a wonderful cabin. I would highly recommend it! Everything was as described. If you want a cozy mountain weekend in a 70�s blast from the past, the flying saucer is right for you. Great fireplace and home layout for a group or a few couples. Can�t wait to go back. This place was really amazing! We had some beautiful snowfall with gorgeous views of the forest and tree tops. Check in was easy and very accommodating for our schedule and the dogs LOVED the place (they even had a dog box with balls and towels and blankets). There's a dog door and a nice big foresty yard. The tv's were a little confusing but we weren't in town to watch tv so it didnt matter to us. The driveway is very steep so we parked below the house which has a beautiful stone staircase leading from the doors to the parking space. There were books and games for winter storms and it was pretty close to downtown. We had a wonderful time, it was a really great winter holiday. The fireplace was also really toasty and nice. This cabin was awesome. We can't wait to come back. 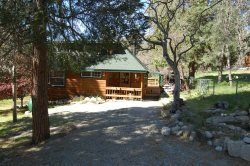 This home is cozy and has everything needed to enjoy Idyllwild. The bedroom downstairs is attached to the bathroom so if you are upstairs it may be a bit difficult. The yard is enclosed and clean. There are vaulted ceilings and simple wood work but beautiful.Great lighting. Warm enough in the midst of freezing temps for all you city folk. Plus a huge TV and fireplace. Excellent getaway! The management is fantastic. Beautiful view, funny concept of having a circular house, made walking around it easy. The point it's less than a 5min walk which is a nice view and fun area to wander around in nature. Fantastic location, spotless upon arrival. Internet works great for streaming and we never had an issue phone service (Verizon). It's a one mile drive/walk to town center. Would stay again in a heartbeat. We enjoyed this simple, quiet spot away from the main part of town. The interior had the right feel of a mountain cabin, with high-beamed ceilings and fireplace. It was an easy 5 minute drive to town. Note: there is no wifi and they don't provide coffee/tea, so best to bring your own amenities. Great place, great price, nice folks! Overall, we enjoyed our stay here. The enclosed yard was perfect for our 2 small dogs. Do make sure the driveway gate is pulled across securely so dogs can't get out or in. One day, a neighbors large dog must have got out of his yard and was barking at our dogs, just outside our driveway gate. He eventually left after we brought our dogs in and we never saw him again the rest of our stay. It is a quiet neighborhood,surrounded by lots of trees. The house was well appointed. We did find the house a little too dark inside,during the day likely due to the dark wood trim and the many trees surrounding the house. We had to use the indoor lighting during the day. The vacation rental team were very helpful and responsive. We did pass on suggestions for improvement to the rental team. nicer than most of the surrounding houses. Good pick. Had a great stay. This was our first trip to Idyllwild and we really enjoyed our trip. The cabin was rustic but clean and had everything we needed for our stay. The big plus for us was it was dog-friendly which is a must for us. The location is just outside of town and a very short drive (2-3 min). It is walkable - about 10-15 min - but there are no sidewalks and it gets very dark at night so we were uncomfortable walking along the road. However, the cabin is fairly secluded with a great deck off the back. We had a great time and will definitely be back! Great home in a very convenient, but quiet area. Quick trip to town and views to die for. An authentic log cabin! The stone fireplace hearth is lovely, and having two bathrooms, one upstairs, one downstairs, was ideal. It's not in the heart of Idyllwild, but in the next town of Pine Cove. Nice and quiet!! Everything is really close to each other, so it was only 5 minutes to get to town. We had a little trouble getting the dryer to dry the clothes, but at least their machine washed them. They had menus for the local restaurants, trail maps, real estate magazines, fresh flowers... all very nice touches. Great location and perfect vacation destination. Their flexible check-in time is very helpful for your travel planning. What a cool place! I love the rustic interior, outdoor deck, and proximity to town. Our family loves coming to Idyllwild and this was at the top of the list of best places we have stayed. Great connection to the outdoors with the cabin surrounded by trees near a creek. Cant wait to come back. This cabin is stepping back into the seventies in both amenities and decor. Everything is well maintained and spotless so it just works, but the little things remind you of times gone by - from the perfectly ordered National Geographics that go back to the 1930's, to the assortment of puzzles and board games. The cabin itself is about a mile from downtown and very near several trail-heads for easy hiking. On the downside, the WiFi doesn't work well and cell access is limited (Verizon was poor, but AT&T worked). Glad I found this rental and that it allowed to bring dogs. Also liked the deck and fenced in backyard where the dogs could run around safely. The fire pit / fire place was also nice to enjoy. The place was clean and I appreciated the managements communication and accommodation for a late check-in. The freezer, at first was not closing all the way and the toilet was running water, minor things that we reported to Management. We had a great stay! The only upgrade I would suggest is to update pots and pans in the kitchen and to be more clear about the agreement as it was confusing, some of the things in the agreement do not apply to this rental. FYI, I would say that one would need to have a car to go to the town, it�s about 3 miles away. Loved the property and area. It was the perfect getaway.